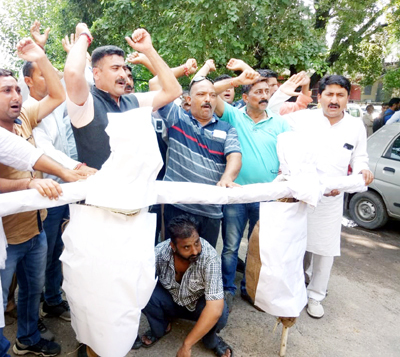 AJKPC members staging protest against NC and PDP in Jammu on Tuesday. JAMMU, Sept 11: All Jammu Kashmir Panchayat Conference (AJKPC) today castigated the National Conference (NC) and the Peoples Democratic Party (PDP) for dragging Panchayati Rai Institutions (PRIs) into their `dirty politics of blackmail’. The AJKPC slammed the NC and the PDP leadership for announcing boycott of the upcoming Panchayat elections, saying both the parties have resorted to their old tactics of blackmailing the Government of India and the State Government for their vested interests. “There is nothing new in the boycott call made by the NC and the PDP. They are just resorting to their decades-long tactics of blackmailing the Government of India and the State Administration, presently headed by the Governor, to derail the election process because they never wanted to empower the people for their personal interests,” said Anil Sharma, AJKPC state president while addressing the former Sarpanches and Panches during a protest here. The protestors burned the effigies of NC president Farooq Abdullah and PDP president Mehbooba Mufti for politicizing PRIs to achieve their political goals. The AJKPC leader said both the parties must understand that Panchayats are community institutions to empower the people at grassroots level. “These institutions have nothing to do with any political outfit of the state. We will not allow these parties to scuttle election process for their political gains,” Sharma said. He said the issue of Article 35-A, which has its genesis way back in 1954, was sub-judice in the Supreme Court, and the PDP and the NC should not use Panchayats to influence the court of law over Article 35-A. He mocked at the leadership of both the parties for the decision of boycotting the Panchayat elections, saying “they should first ask their MPs and MLAs to resign from the Parliament and the State Assembly to show their sincerity, if any, over Article 35-A”. The AJKPC state president also made a passionate appeal to the Governor Satya Pal Malik to conduct Panchayat elections as per the announced schedule. “These opportunist political leaders must understand that all problems, at grassroots level in J&K, are related to non-existence of institutions of local governance. The people are feeling alienated because of non-existence of Panchayats. The conduct of Panchayat elections will restore their faith in governance,” he said. Prominent who addressed the gathering were provincial president Jammu Gautam Singh, provincial vice president Raj Kumar, ex-Sarpanches Madan Mohan Dubey, Balbir Singh, Mohan Lal, Pritam Chand, Munshi Ram, Liquat Ali, Mohan Lal, Rattan Lal and Girdhari Lal.